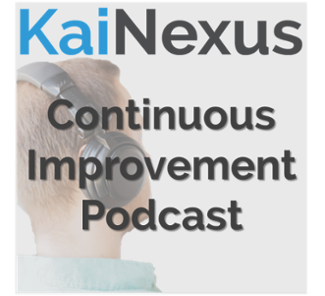 If you’ve been a subscriber to our KaiNexus Continuous Improvement Podcast, you might have noticed a small detail that changed (if you’re not a listener or subscriber, we hope you’ll start). For one, we think the change doesn’t harm you, the podcast customer, in any way. If you’re a subscriber, podcast apps display the episodes in chronological order already. If you sort by date, you don’t need the episode number. If you disagree about this change being benign for you, please leave a comment on this post and share your feedback. In the early days of our podcast in July 2015 (yes, it’s been around long enough for there to be long-ago early days), I (Mark Graban) was the only one creating episodes. 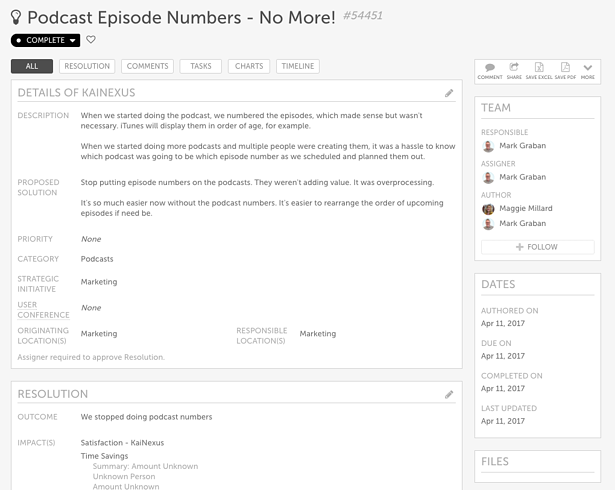 Initially, the podcasts were just the audio from our monthly webinars (and that’s an idea that came from one of our customers). Later, I started added more content, such as audiobook versions of blog posts, read by myself and then, eventually, by others. Even with others reading their blog posts, I was the only one uploading files and managing the podcast hosting and release process. Over time, it made sense to spread out that workload with our wonderful director of marketing, Maggie Millard. Now, with a podcast nearly every day, we had more episodes to work with. Numbering the episodes became a burden and something that required a lot of coordination and checking back and forth. Maggie would plan blog posts and their corresponding podcast, while I’d be doing other podcast episodes and webinar recordings and such. We were constantly communicating back and forth about which episode was going to be which number. Let’s not use episode numbers anymore! Easy as pie. Mmmmm…. Pie. From a Lean perspective, the episode numbers (and all of the coordination) could be considered the waste of “overprocessing” or work that adds no value to the customer (you the listener). It’s just adding cost to us. From a Kaizen perspective, Maggie and I had the ability to say “yes” to the idea. We didn’t have to create a project charter or an A3, as you might do for a larger improvement. We didn’t need to check for alignment to our Strategy Deployment goals. We didn’t have to wait for an executive team or our CEO to review and approve the idea. We just did it! We felt pretty secure in our hypothesis that our customer wouldn’t mind the change. Nobody has complained so far (not that a lack of complaints means your customers are all happy or as happy as they could be). We implemented the change and, boy, has it made our work a bit easier. Kaizen! Good change! In fact, when I wrote this blog post, I immediately did the recording and uploaded it to our podcast host. I didn’t have to worry about the episode number sequence or when Maggie would publish it. This is still a good change, or so it seems. We document our improvements so we can share them with our colleagues, partly in the hopes they’ll be inspired to do something similar in their own work. That’s one of the cool things about Kaizen and a culture of continuous improvement. And, we can choose to share it with you! We hope you enjoy the podcasts… if you’re listening to the audio version of this, thanks! We hope you’ll keep listening!